Since Google's Developer Day, I have been promising to speak more regularly about Google products. This is a bit of a balancing act for me as I want to avoid the slippery slope of becoming a corporate sock puppet. I also don't want to neglect my real interest in connected systems, SOA, and asynchronous messaging. With the Internet turning into the largest connected system (see my The Cloud as the New Middleware Platforms track on at QCon), the gap between Web-based technologies and connected systems design has become significantly smaller, allowing me to combine interests and Google developer products more naturally. Of course, the fact that Google is rolling out new developer products and API's around the clock, does not hurt either. What's funny, though, is that my first official external Google appearance was staged in the land of the rising sun, far far away from Mountain View. So it was just a matter of time until I took a closer look at Google Gears. While I have no aspiration (or hope) to become Mr. Gears, I find Gears to be quite fascinating. Like many new technologies, Gears was a bit misunderstood at the beginning. Many people (myself included) equated Gears with offline browsing. I think to some extend this image was reinforced through many of the early demos, which focused on making all sorts of Web sites (Wikipedia, Google Maps, what not) available offline. While this is very tempting (I could not resist but build my own offline calendar app in Gears), looking only at offline is a very narrow view on Gears. caching of resources, such as HTML pages, images, CSS, etc. This seems like a good time to point out that code.google.com is a little schizophrenic. It's an open source code repository as well as Google's developer support site. You could say it is MSDN and Sourceforge in one. Likewise, the content related to Gears is split into two distinct parts: the open source project repository and the Google Developer site. It kind of makes sense when you consider that Gears is an open source project (which happens to be hosted at code.google.com), but is still considered one of Google's supported developer products (so tutorials and documentation are available just like for other APIs). 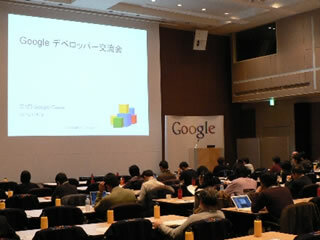 Google Japan has been hosting a series of "developer round tables" to share information about Google API's and developer products with the local community. I like the format – it typically consists of a presentation followed by a panel discussion. I stated many times that I am a big fan of panels – they provide the kind of interactivity that you can't get from a blog. Roundtable #4 focused on Gears, and I had a chance to take on the presentation slot, which will be made available on video. The panel was held in Japanese, so that was off-limits for me because people wanted to hear more than "eki wa doko desuka", i.e. "where is the train station". The panel consisted of two Google developers and four invited guests, moderated by Naoki-san, a product manager and developer relations manager in Japan. Most of the panelists demo'd applications they built in Gears and described their experiences building these applications. I really enjoyed this focus on real developer experience -- this was definitely not a marketing event! 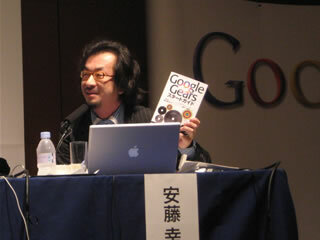 Ichikawa-san, one of the Google developers on the panel, showed a demo application that can suggest keywords as the user types into an input field, similar to Google Suggest. The application is extremely responsive because the application uses a local SQL database with a 'LIKE' query clause. In a lucky stroke of genius, a Japanese publisher managed to publish a book on Gears the very day of the roundtable. Naturally, the book got a bunch of free PR during the event. Ito-san from WebOS Goodies pointed out that more powerful API's in the browser will lead to less dependence on server resources, reducing server cost. This may enable more people to implement their dreams to create web applications. The event also included a Q&A session, giving the audience a chance to pose questions directly to the developers or the invited panelists. Of course, it's also useful feedback for us to hear what concerns developers. Questions included Google's future plans (naturally, the answer is a little vague), especially the relationship to the offline support coming in FireFox 3.0. Google and Mozilla are actually working quite closely, so I don't see much of a conflict. Also, Gears is a cross-browser platform API, so it's inherently broader in scope than a FireFox only feature. Lastly the FireFox off-line capability does not include an actual database that can store and search structured data. Naturally, attendees were curious about Gears support for mobile applications. It's easy to see that Gears' features are particularly interesting in a mobile environment where high latency and spotty connections can plague browser applications. With Android around the corner, I am sure we are bound to hear more about this topic.